This week, the House Appropriations Committee approved the FY ’15 Financial Services and General Government (FSGG) Appropriations bill. The Committee’s bill includes $230 million for the CDFI Fund – an increase of $4 million over current year funding and $5.1 million over the President’s budget request. 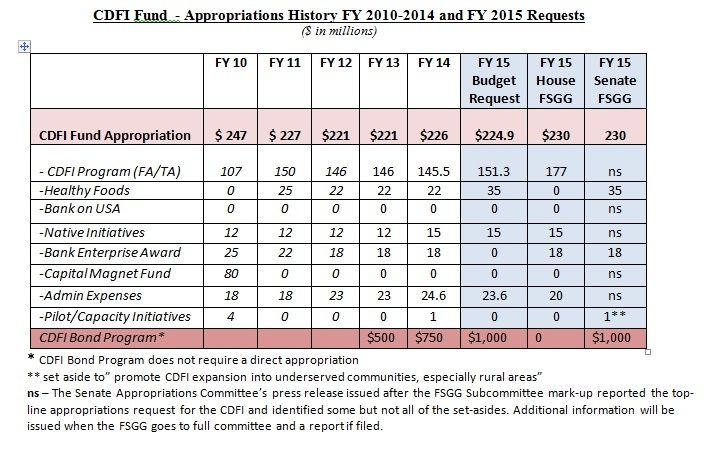 As the chart below shows, the House bill sets aside $177 million for the Fund’s Financial Assistance (FA) and Technical Assistance (TA) grant programs, and those set-asides are provided in bill language. In addition, $15 million is set aside for the Native American CDFI Initiative, $18 million for the Bank Enterprise Awards (BEA) program, and $20 million for CDFI Fund administrative expenses. The House Appropriations Committee did not include funds for the Healthy Food Financing Initiative (HFFI) or authority for the CDFI Bond Program, as requested by the President. This past Tuesday, June 24th, the Senate Financial Services and General Government (FSGG) Appropriations Subcommittee approved its FY ’15 spending bill. While the bill has not been released to the public, Senator Udall (D-NM), who Chairs the Subcommittee, spoke during the mark-up about his commitment to “target resources to boost job creation and community development,” including $230 million for the CDFI Fund in the spending bill, along with $1 billion in CDFI Fund Bond authority. A press release issued by the Appropriations Committee reported some–but not all–of the CDFI Fund set-asides, including $1 million to promote CDFI expansion into underserved areas, $35 million for HFFI, and $18 million for BEA. Additional information on the Senate’s FSGG Appropriations bill is embargoed until the bill goes to the full Appropriations Committee–a move initially planned for Thursday, but which is now postponed indefinitely, along with action on several other Appropriations bills, including the Labor, HHS bill and the Energy and Water bill. On Thursday, June 25th, the Senate Indian Affairs Committee, chaired by Senator Jon Tester (D-MT), held an oversight hearing on “Economic Development: Encouraging Investment in Indian Country.” Dennis Nolan, Acting Director of the CDFI Fund, testified at the hearing, as did Gerald Sherman, Vice Chair of the Native CDFI Network. Much of the testimony offered and questions posed by the Senators in attendance, including Senators Tester (D-MT), Barrasso (R-WY), Crapo (R-ID), Heitkamp (D-ND), and Begich (D-AK), focused on how the CDFI Fund and programs administered by the Fund could be fully utilized to reach and serve Native communities and Native CDFIs. A complete list of the witnesses and copies of their written statement can be found on the Indian Affairs Committee website (www.indian.senate.gov) along with a video of the hearing.